At the moment Israel is surrounded by enemies who pose an existential threat to her. Hezbollah in the North and HAMAS in the South. Then there’s ISIL—The Islamic State of Syria, Iraq and the Levant—whose goal is to set up a caliphate, which for the most part is succeeding in Iraq. The Levant includes Israel and of course Jerusalem. The Moslem Brotherhoods, Imam, Highazi declared that Jerusalem would be capital of the United Arab States, essentially the Brotherhood’s version of ISIL’s Caliphate. It would appear that Jerusalem is the prize. 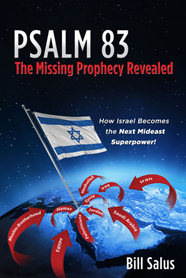 Psalm 83 war, was put forth by author Bill Salus. Bills book is a best seller and is thoroughly researched. I believe we are on the eve of seeing this happen. 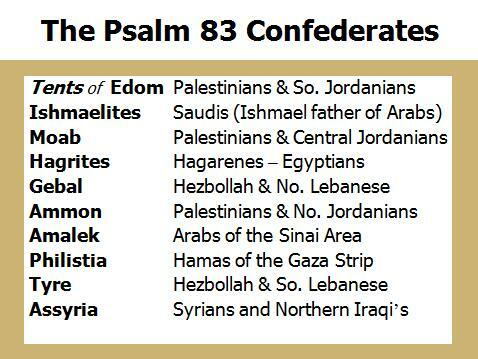 The Psalm 83 war may be looming and it certainly will have implications far greater to most Americans than those of the media evisceration of Bill Cosby’s alleged sexual peccadillo’s, which is a trial by the media and is nothing more than a distraction. The hatred of Israel is reaching a fever pitch. I don’t believe there is a solution, as the radical groups mentioned above have written in their charters to destroy Israel. As I have mentioned here many times, there is a supernatural component to what we are seeing and it jibes with the Biblical narrative, specifically the prophetic one. In short: What was written will come to pass. What was foretold will unfold.